Three cheers for the red, white, and blue! 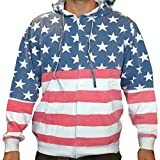 Sport your patriotic spirit with this star-spangled American flag zipper hoodie. 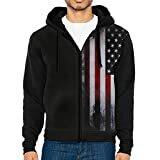 There’s nothing more patriotic than proudly wearing this zipper hoodie reminding us all that Americans are united under one flag. For Independence Day or any day, wear your devotion to the good ol’ U.S. of A. wrapped in stars and stripes. 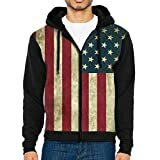 American Flag Vintage Printed In Front With Whole Black Back. Fashion Trendy Elements In Design,very Street Style,funny And Cool,unique. Vintage American Flag Printed In Front With Whole Black Back. Fashion Trendy Elements In Design,very Street Style,funny And Cool,unique.